What's better than one Who HQ book ? Six Who HQ books! Who Was Abigail Adams? By True Kelley; read by Ann Marie Lee. Listen to find out more about a smart and independent colonial girl, both the wife of a president and the mother of a president, and the first First Lady to live in the White House. What Is the Constitution? By Patricia Brennan Demuth; read by Kathleen McInerney. Listen to find out more about a document written in 1787 that outlines how our government works. There was lots of arguing over what it was going to say, and the meetings in Philadelphia were so secret that windows were sealed to prevent eavesdropping. What Is the Declaration of Independence? By Michael C. Harris; read by Marc Cashman. Listen to find out more about a document that announced that the thirteen colonies were splitting from Great Britain. The signers of the declaration risked being put to death as traitors. The declaration continues to inspire people all around the world who yearn for freedom. Who Was Alexander Hamilton? By Pam Pollack and Meg Belviso; read by P.J. Ochlan. Listen to find out more about an orphan from the West Indies, the first secretary of the treasury, and a founding father of the United States. Who Was Betsy Ross? By James Buckley Jr.; read by Emily Lawrence. 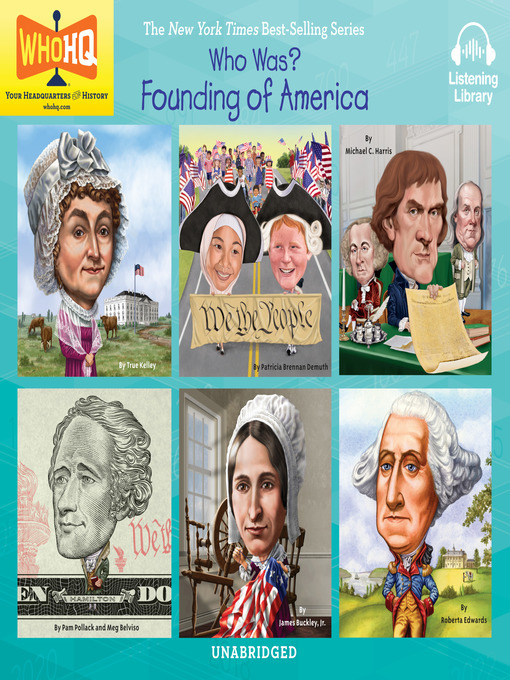 Listen to find out more about a girl from Philadelphia who loved arts and crafts, a seamstress who made blankets and tents for the Continental army, and the woman behind the legend of the American flag. Who Was George Washington? By Roberta Edwards; read by Mike Chamberlain. Listen to find out more about a boy who had a cold and bossy mother, a great athlete and horseback rider, and the very first president of the brand-new United States.